The OWL 360 Bicycle Rearview Camera mounts to a bicycle for providing a clear view of the road behind. 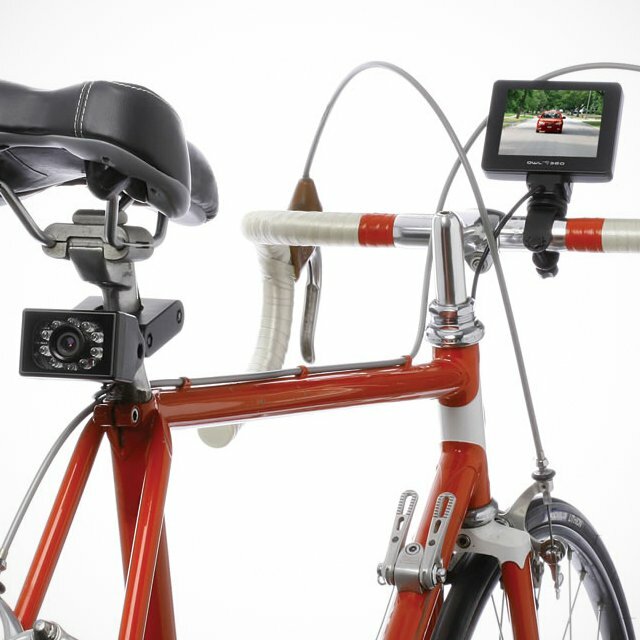 The 2 1/4″ W x 1 1/2″ H camera mounts to a bicycle’s seat post, providing a rear-facing 75º field of view ideal for seeing approaching vehicles or other cyclists. A 78 3/4″ zip-tied cable that accommodates any frame geometry connects the camera to the handlebar-mounted 3 1/2″ TFT color monitor (fits bars up to 1 1/4″ diameter); quick-release mechanism removes the monitor easily from handlebars for charging. A circular pattern of red LEDs flash constantly for optimal visibility to traffic and the camera’s built-in sensor detects low-light conditions.